For those of you who want the bottom line first, I'll just say that if you like Nature Valley Crunchy Peanut Butter Granola Bars, you'll like these. For those of you who'd like me to entertain you for a couple of minutes, read on. Ever notice how the Nature Valley commercials always show people eating those granola bars while sitting on a rock next to a crystal lake among pristine mountains and pine trees? The woman takes a bite, closes her eyes, and appears to climax for a moment. In reality, most people are eating these bars in their car on the way to work, and bursts of crumbs are popping off with every bite, soiling nice suits and business slacks, garnering curses with each crunch, causing near-accidents as drivers take their eyes off the road to swipe crumbs off of their laps and onto the floor mat. Drivers know they should just stop eating the bar and finish it in the parking lot, but they just taste so darn good that people can't stop. Yeah, well, these TJ's bars are the same kind of deal. In the past, we were delighted with TJ's Fiberful Peanut Butter Bars. And the Peanut Butter Oat Bars were pretty tasty, too. Trader Joe has this peanut butter bar thing down pat. Especially when they're really just ripping off companies like Fiber One and Nature Valley. But hey, if it saves me a buck, I won't call you out on your unoriginality, Big Joe. With two grams of fiber per bar, they're good for the digestive system, not to mention, quite filling too. And five grams of protein is nice for energy and stuff. All in all, a healthy, tasty snack. 3.5 stars from me. 4.5 stars from Sonia. Ha! I laughed out loud when I read the part about eating them while driving to work and getting crumbs all over their suits. That is me! But I like the plain granola bars, too - in the blue and white box. I've never tried the peanut butter ones before! I'll check them out. Glad you enjoyed that, caroline :) I've never tried the plain ones. We'll have to check those out. Thanks for the recommendation! I can't seem to find these anymore at my local Trader Joe's! WTF JOE?! I was at my local TJ's yesterday loading up on the things I only need to buy once per month and after standing befuddled where the granola bars should be for a few minutes my hopes were dashed by staff. 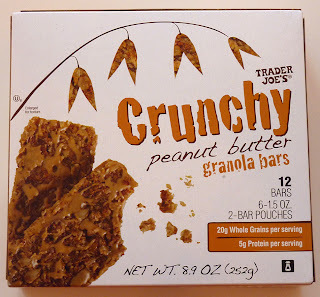 Our crunchy granola bars have been discontinued! You have hurt me Trader Joe's. Excuse as I must be off to complain about this throughout my social media channels.